VMC is getting a new high-rise office building. These signs suddenly appeared last week at the southeast corner of Edgeley and Apple Mill. On a side note, practically every property owner in the VMC area has heard the rumour (and believes it) that Wal-Mart will be torn down within 12 months. Even sources at Smart Centres are saying it. Wal-Mart management isn't saying anything because they don't want to scare their employees. Basically, DRP members asked for better architecture for this building. Edit: found a rendering of the proposed office building. Mods, if you think this project deserves its own thread, feel free to move this post. TORONTO, ONTARIO--(Marketwire - Oct. 31, 2012) - Calloway Real Estate Investment Trust (Calloway) (TSX:CWT.UN) today announced a 50/50 joint venture with SmartCentres to develop a vast tract of land (53 acres) within the Vaughan Metropolitan Centre (VMC). The Calloway VMC lands are strategically located adjacent to the terminus of the Spadina-York subway station in Vaughan and will be home to almost 6 million square feet of commercial, residential and retail development. Construction of the first building will begin in 2013. "The Calloway lands will be the heart of the VMC," said Al Mawani, President & CEO of Calloway. "The VMC is the most exciting urban development in all of Canada. The Vaughan subway station together with the new regional bus terminal will connect the 905 to downtown Toronto and downtown Toronto to the 905. Also, the close proximity to the major roads and highway infrastructure, namely Highways 400, 407 and 7, makes our property a uniquely attractive location for corporate offices, retail and new residential development." Calloway's VMC lands are currently "virtually undeveloped". To put this in context, upon completion, the Calloway JV lands will be similar in uses, densities, public transit and size to an area bounded by Bloor Street to Charles Street and Avenue Road to Jarvis Street in Toronto. The first building to be constructed under the Calloway JV will be a Diamond & Schmitt Architects designed 300,000 square foot office tower with KPMG (one of Canada's largest international accounting firms) as the lead tenant. Construction is scheduled to begin in 2013 with completion in 2015. When complete, the 1200 people who will work in the KPMG Tower will have direct connections to both the subway station and the regional bus terminal by an underground pedestrian tunnel. Plans for the Calloway JV also include a major central park, civic square, and other associated uses supporting such urban city centres. Not the best looking tower but the nicely landscaped front can make up for it. Also love the tall pillars at ground floor but I cant help but think I've seen this somewhere before. 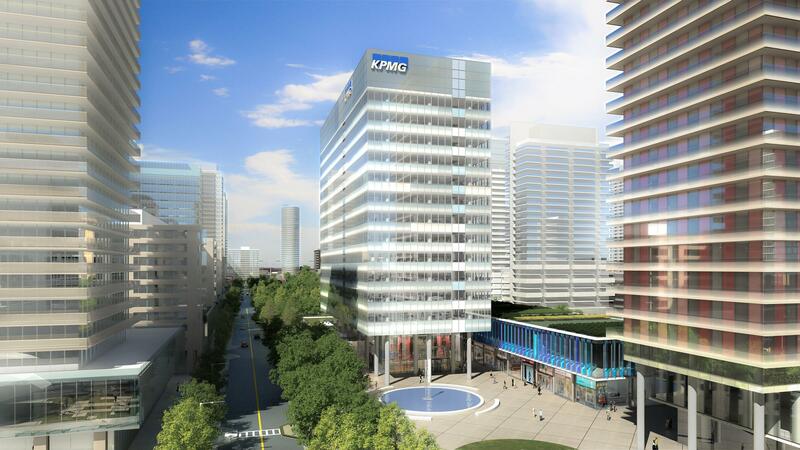 Maybe the boring glass box on tall pillars is the branded image that KPMG is going for in the GTA. I guess one key question here is where are these workers coming from, shifting from their downtown location ? Or other workers throughout the GTA. Considering they just signed a long term lease at BAC - I doubt they're shifting workers. This is probably natural expansion as they couldn't get any space in their existing tower. KPMG also has a substantial office location at Yonge and York Mills - there could be some people shifted from that location. If real life is anything like that rendering we have a winner overall. "Without Sicily, Italy leaves no image in the soul. Sicily is the key to everything." â€” Johann Wolfgang von Goethe. this is correct - majority of the clients in this office are actually GTA (vaughan, markham, etc.) and this office will be shifted to the VMC. Yes but why, most companies are consolidating space to more efficiently manage office space and group people together under one roof. There is a lot more space in the tower going up just beside BA center west. A consequence of all the other companies that don't locate in the core. That is a lot of office buildings; or maybe most of those will be office-building-look-alike condos. Offices for accounting firms need to be geographically dispersed since the clients are everywhere. Though a lot of the staff work remotely (audit staff at working at the client's offices for example), there needs to be close facilities available to staff in case the client office closes at a certain time, and they need to continue their work in the office.